I love to decorate at Christmas. It just epitomizes my joy over the season as we celebrate the birth of our Savior. So I thought for the next week or so I'd just share some of the decorating things I'm doing for fun. I bought a new runner this year. When I saw this lacy linen cloth at Winners I simply had to have it. It's delicate holly reminded my mother and I so much of our Irish heritage. So putting this down on my front foyer table created a snowy feel. 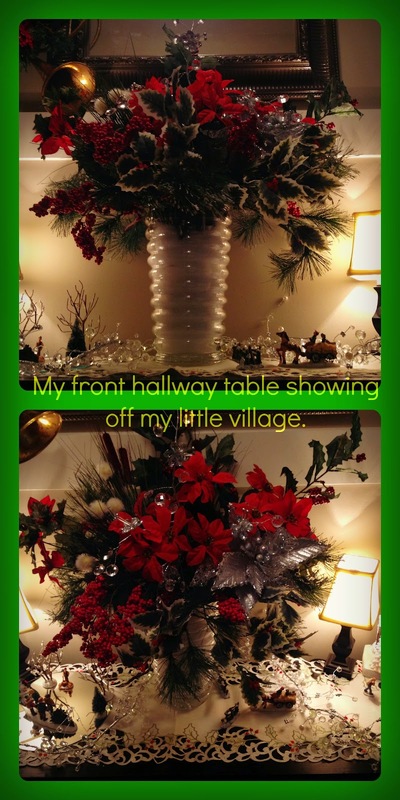 I added my white Christmas lights in a swirl around on top, set my little Christmas village around and added the floral display directly under the mirror. Using only whites, silver, red poinsettias and holly, it blended very prettily with the runner and I think gave that outdoors Christmasy feel. Some closeups of the little village. And here is the overall view when you open the front door. I hope it's welcoming.